Driving a large snow pusher from site-to-site can be difficult and even costly if you are ticketed for an oversized-load. 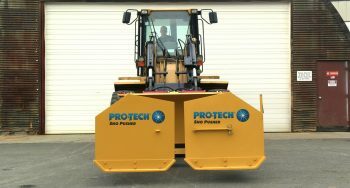 The Foldout Sno Pusher eliminates those fears by folding to 8’6″ which is road legal in most areas. In addition, the Foldout model is perfect for properties that contain many obstacles such as gates, bollards, and narrow wall passages. 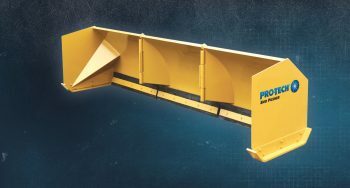 The Foldout Sno Pusher can also eliminate the need for multiple snow pushers across different properties by making it easy for operators to travel during a snow event. FP14L 13’10”/ 102” 3450 lbs. Loader – 1.5 yd. 48″ 48″ x 48″ 19 yd. FP16L 15’10”/ 102” 3650 lbs. Loader – 2.5 yd. 48″ 48″ x 48″ 21 yd. FP18L 17’10”/ 102” 3850 lbs. Loader – 3.5 yd. 48″ 48″ x 48″ 23 yd.